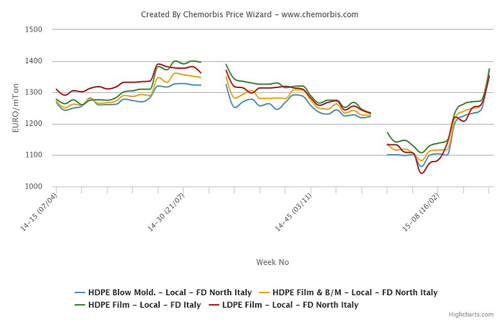 According to ChemOrbis, the European PE market is seen extending its upward trend into April as producers are aiming for three-digit hikes for a second consecutive month despite the relatively slower gains in the upstream market. An initial April ethylene contract settled up €35/ton from March towards the end of last week while the contracts are yet to be finalized. Hike requests for PE were already expected to outpace the increases in feedstock costs given rising supply concerns. Following Borealis, Versalis and LyondellBasell, SABIC also declared force majeure on the output from its LDPE/HDPE swing plant in Gelsenkirchen, Germany, according to market sources. The company reportedly faced technical issues at their 175,000 tons/year plant. As a result, almost 1.4 million tons/year of PE capacity in Europe has been impacted by these force majeure declarations. After settling their March PE contracts with increases of €120-130/ton, a South European producer announced their new April PE prices with hikes of €100/ton for LDPE and LLDPE and by €130/ton for HDPE. A producer source cited higher feedstock costs and short supply as the main reason behind their sharp hikes.